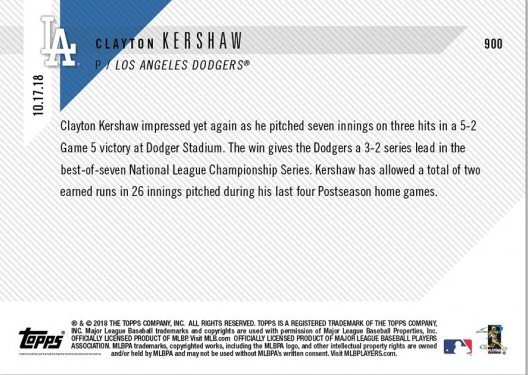 Last night's thrilling victory had many heroes, and Topps was sure to memorialize as many of them as possible in their Topps Now set. Featured here are four new base cards and the five autographed Kershaw cards that sold simultaneously. 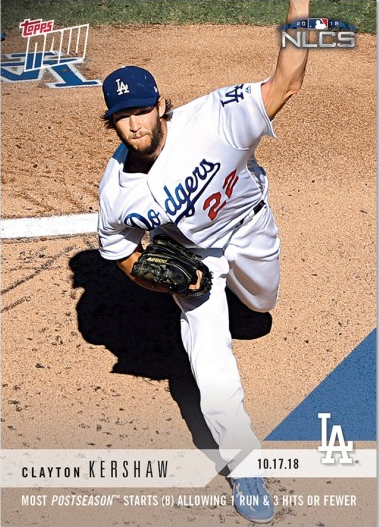 BTW, all of those Clayton autographed cards are sold out. Clayton Kershaw impressed yet again as he pitched seven innings on three hits in a 5-2 Game 5 victory at Dodger Stadium. The win gives the Dodgers a 3-2 series lead in the best-of-seven National League Championship Series. 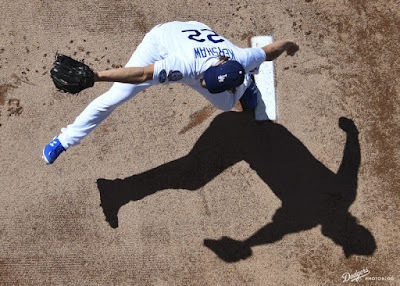 Kershaw has allowed a total of two earned runs in 26 innings pitched during his last four Postseason home games. 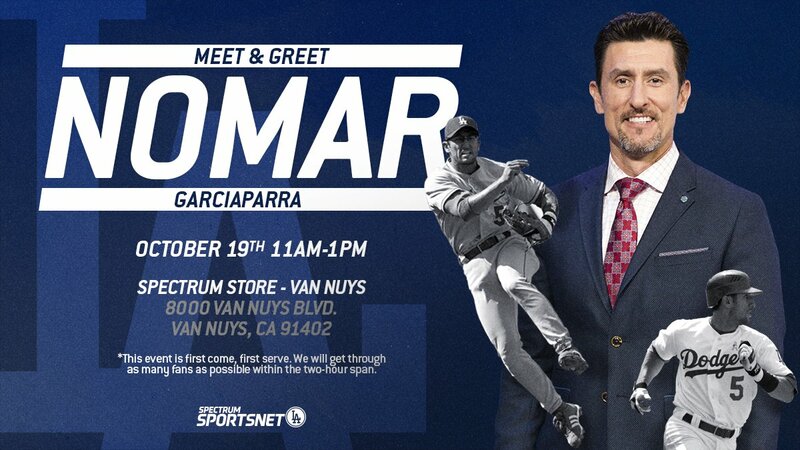 Weekend Autograph Opportunity: Nomar and Kobe! “You could see the same look that you always see. There’s a determination. And when you get a champion like him that gets hit around a little bit, he’s going to respond. And that’s what he did today,” said manager Dave Roberts. Clayton went seven strong innings, struck out nine, walked two and allowed just one run to cross the plate. It was also his eighth career postseason start where he has allowed just one run and three hits or fewer. Per Katie Sharp on twitter, no one else in the history of the game has done this more than five times. Additionally, this was his ninth career postseason start where he has gone more than six innings and allowed one run or fewer. This ranks him tied for seventh place on the all-time list, per Eric Stephen on twitter. This Day in Dodgers History: In 1977 Yankees outfielder Reggie Jackson broke LA's heart. 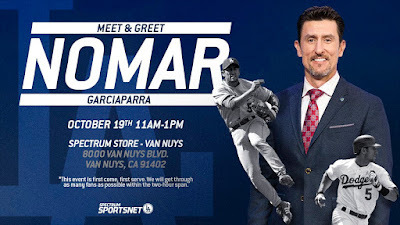 He walloped three homers on three consecutive first-pitch at-bats against the Dodgers to win Game 6 and the World Series. If you must you can watch highlights here. Happy Birthday, Burt Shotton, Wally Millies, Roy Cullenbine, Andy Carey, Jerry Royster, Alan Mills & Alex Cora!